ABT Sportsline has upgraded its program for the Audi R8 GT in time for the Geneva Motor Show. 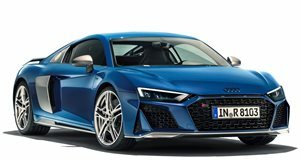 Audi tuning specialist ABT Sportsline has updated its GTR aftermarket program for the Audi R8 GT in time for a reveal at next week’s Geneva Motor Show. First on the agenda was shaving weight off the supercar. This was achieved by fitting a new carbon-fiber aero kit including a new hood, front and rear aprons, new side skirts and a rear wing, resulting in a curb weight trimmed by 110 kg down to 1,515 kg. Other exterior mods include a set of 19-inch alloys, a stainless-steel exhaust, and an adjustable coilover sports suspension. Under the hood, ABT tweaked the 5.2-liter V10 FSI engine, increasing output from 550 horsepower and 398 pound-feet of torque to 620 hp and 405 lb-ft. The result is an improved 0-62 mph time of 3.2 seconds and a new top speed of 202 mph.